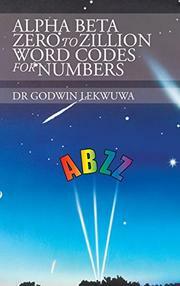 Debut author Lekwuwa delivers a guidebook about a system for remembering numbers. Welcome to the Alpha Beta Zero to Zillion word-code system, a method that the author says “can be used to convert any given number to word code equivalents.” His book provides consonant abbreviations that can be used to denote numbers zero through nine; for example, the number 5 can be represented by either “L” or “V.” The idea is to then create a word that will encompass the number (or numbers) that one wants to remember. Vowels have no values in the system, so consonants may be joined with any vowel that’s convenient. As the author explains, “The consonants act as bricks in which numbers are inscribed. The vowels act as mortar which bond the bricks together.” For instance, one could represent the number 456 with the word “Files” (four is “F,” “I” is neutral, five is “L,” “E” is neutral, six is “S”) or, as the author suggests, “False” or “Flies.” Lekwuwa devotes the bulk of the book to similar suggestions (for example, 6063 may be remembered as “Sarasota” and 8634 as “Justify”), and once readers learn the basics, they could feasibly memorize all sorts of other numbers using words. Although the book’s initial premise of associating, say, the number five with the letter “L” isn’t necessarily intuitive, one need only learn a few rules to open up a world of numbered possibilities. The method may perhaps be clumsy for smaller numbers; wouldn’t it be easier to simply remember “456” than the word “Files” and a decoding system? However, the beauty of such a process comes from encoding and decoding larger numbers. Also, the encoder has great leeway in making words of their own choosing, which allows for a degree of elegance. The author is keen to point out that although he provides many suggestions, “users are entitled to use alternative words which are more appealing to them.” Those who are willing to learn the system’s foundation will have more than their share of bricks and mortar at their disposal. A number-remembering system that works, although mastering it may take some practice.